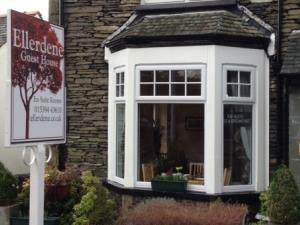 Ellerdene Guest House015394 43610work Guest HousePhil & Rick welcome you to Ellerdene Guest House, which is close to attractions such as Lake Windermere, the home of Beatrix Potter, and many more within easy reach on foot, car or public transport. There is a wide range of pubs, restaurants and cafes to choose from in Windermere village which is a two minute walk from the Guesthouse. There are many short walks nearby to enjoy the breath taking views Lakeland has to offer. Ellerdene Guest House sometimes limits bookings to 3 or more days. Standard Size Double Bed with limited floor space. PLEASE NOTE THIS ROOM IS A SMALL DOUBLE ROOM WITH A STANDARD SIZE DOUBLE BED AND LIMITED FLOOR SPACE. SINGLE OCCUPANCY @ ROOM RATE MINUS £10 PER NIGHT. 1 SMALL WELL BEHAVED DOG @ £10 PER STAY PLEASE BE AWARE THIS PRICE DOES NOT ADD TO THE BALANCE AND WOULD BE PAYABLE ON ARRIVAL. 2.Small Double sometimes limits bookings to 3 or more days. Phil & Rick welcome you to Ellerdene Guest House, which is close to attractions such as Lake Windermere, the home of Beatrix Potter, and many more within easy reach on foot, car or public transport. There is a wide range of pubs, restaurants and cafes to choose from in Windermere village which is a two minute walk from the Guesthouse. There are many short walks nearby to enjoy the breath taking views Lakeland has to offer. Special dietary needs with prior notice. Packed Lunches are available at extra cost. SMALL well behaved dogs are welcome for a fee of £10, but not to be left alone in the room at any time. Further charges will apply if your pet causes damage or soils inside the building. We offer free Wi-Fi in all areas of the Guest House. Children welcome from age 6. 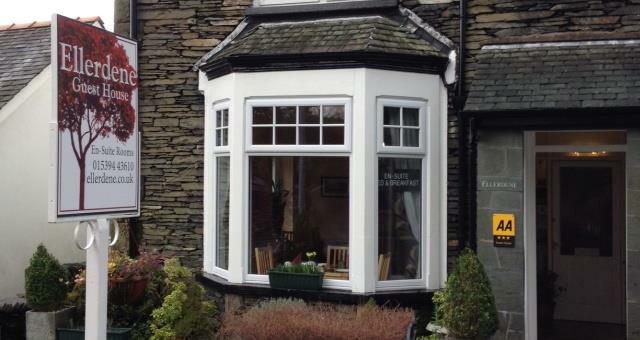 From Windermere train station, walk/drive down hill through the village along one way system. Past Ellerthwaite Square bus stop, then first left into Ellerthwaite Road, we are situated on the right, 6 houses down from Ellerthwaite Lodge. Look for our Red sign.